"We're not sure if this was a miracle, science or what." A courageous and exhaustive 18 day rescue effort to bring 12 soccer players, 11-16 years of age, out of a treacherous cave in Mae Sai, Thailand had an innocent beginning. A decision on 23 June 2018 to celebrate a team member's 16th birthday by exploring the Tham Luang Cave turned into a frightful ten-day period of uncertainty for the players, coach, families--and a watchful world. The dozen Thai boys, members of the "Wild Boars" soccer team, and their coach, Ekkapol Chantawong, were found on 2 July. They were safely removed from the Tham Luang Cave but not without a lot of 12 hour days, and the loss of a Thai Navy SEAL, 38 year-old Samarn Gunan, who died placing oxygen tanks along the passageway to make their rescue possible. News reports have the head of at least one Hollywood production studio in Thailand looking at ways to recount this incredible story. The military, and those in the cave rescue business (yes, that's a business), will spend time looking carefully at this near-tragedy, although the death of diver Samarn Gunan is tragic. They will document the process as we should try to learn from the experiences of others. Based on interviews with the soccer players, coach, families, and rescue workers, what can be gleaned to-date from the miracle in Mae Sai? 1. Pay attention to warning signs. There are signs at the entrance to Tham Luang Cave warning visitors not to take risks. It's reported that locals know not to enter during monsoon season as the cave system rapidly floods with water during that time of the year. Parents tell their children to stay away from the cave. The RMS Titantic, a British ship which sank on 15 April 1912 in the North Atlantic, had received several warnings about icebergs but they were mostly ignored. Nearly 1,500 passengers and crew lost their lives that night. Sometimes warning signs are posted, other times they're not. If they are we ignore them at our own peril, and those under our care. It's worth noting that consequences may be unintended--but also foreseen. Robert Laird, co-founder of International Underwater Cave Rescue and Recovery, observed that "rescues are rare." In an interview in The Atlantic Laird says that when cave divers get in serious trouble, they usually die. "There is no one to rescue, just a body to recover," he adds. Notes Laird, "The worst thing you can do is panic." We know from interviews conducted with the boys that the first few days were filled with panic. It was not until Day 3 that Coach Ek was able to get the soccer team to stop crying. The focus turned to being quiet, breathing deeply, and getting sleep. That emotional reversal created a frame of mind that survival was possible. 3. Admit the need for help. Military experts. International cave divers. Medical personnel. Farmers. And a Thai rock singer. They all played roles in the rescue effort. Narinthorn Na Bangchang, a popular entertainer from Bangkok, who flew to Mae Sai, posted equipment needs on her Facebook page. Bangchang's followers responded in generous fashion. For example, a request for 200 regulator air tanks resulted in 400 tanks being donated. She also found an expert cave diver who trained Thai Navy SEALS. In addition to pumps that took out billions of liters of water from the cave to make the rescue possible, the retinue of resources included 100 plus divers; 500 air tanks; 1o,000 support personnel; 900 police officers; seven police ambulances; and 5,000 meals each day for people on the ground. The Thai Navy SEALS are trained in open water diving, not caves. They knew there was need for greater expertise and welcomed experienced volunteers. When the Thai Navy SEALS arrived at the cave on 25 June they had gotten inside as far as Pattaya Beach, a piece of dry ground four kilometers (2.1 miles) from the mouth of the cave. It was there they found footprints and shoes confirming that the boys had passed this way. When the SEALS decided to turn back due to a lack of air canisters and coming rain, they were just 400 meters (.2 miles) from where the boys and their coach had taken shelter. With heavy rains filling the cave it would be another week before anyone could return. However, giving up was not an option. "We had to dive, we had to walk, we had to climb through stone and rock but we had to keep fighting," says Thai SEAL Commander, Arpakorn Yookongkaew. "If we did not keep moving there would be no hope for the children." Using guide lines set by Belgium-born Ben Reymenants and his diving partner, British divers finally found the boys and their coach on 2 July. In the meantime, the soccer team exchanged letters with their parents, delivered by divers, which further encouraged the boys and their coach. "The Silicon Valley model for doing things is a mix of can-do optimism, a faith that expertise in one domain can be transferred seamlessly to another and a preference for rapid, flashy, high-profile action. "But what got the kids and their coach out of the cave was a different model: a slower, more methodical, more narrowly specialized approach to problems," observed Dr. Zeynep Tufekci from the University of North Carolina. Dr. Tufekci also noted that a "safety culture" approach to problem-solving, along with decades of training, allowed airline captain Chesley Sullenberger to safely land US Airways flight 1549 in New York's Hudson River on 15 January 2009 without incurring any loss of life. 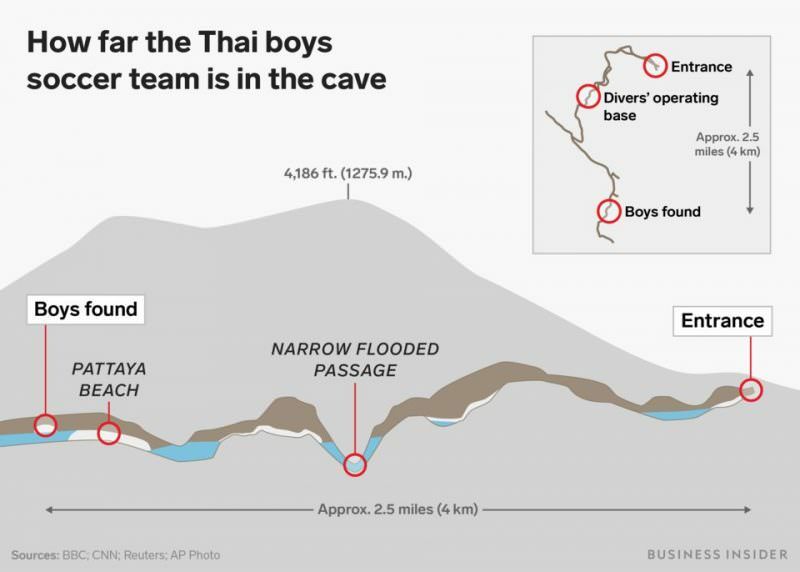 No doubt technology will have a role in future cave rescues but it will likely be in support of a "slow is smooth--and smooth is fast" approach used by a consortium of Navy SEALS and international cave rescue experts in Thailand. While in the cave the soccer coach apologized to the parents in a handwritten note sent through divers. Coach Ek promised to take care of the children during the rescue mission, "as best I can." And he did. It was fitting that the coach was in the last group of four boys to be rescued on 10 July. Staying behind until everyone was safely removed was the right thing to do. No doubt Coach Ek, who was orphaned at age 10, will have plenty of time to reflect on his decision to enter Tham Luang Cave with the soccer team. Successful leaders make mistakes but they generally don't make the same mistakes twice. A lesson for everyone is summed up by the late actor and social commentator, Will Rogers, who in a different era and a world away, once said, "Good judgment comes from experience, and a lot of that comes from bad judgment."